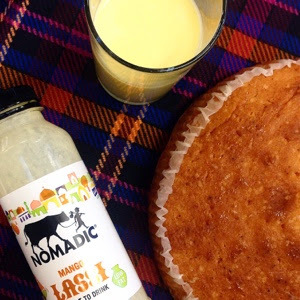 When I first heard about a low fat mango lassi, I thought it was too good to be true. With a stunning label featuring graphics reminiscent of India, I had high hopes when i received Nomadic in the post. I shared a bottle with my colleague at lunch yesterday (along with a delicious home made lemon drizzle cake). Unfortunatly, what greeted us was a bland experience that coated our mouths with thick yogurt. Usually avid Lassi lovers (if there is such a thing) this product really missed the mark. Looking at the ingredients, we started to understand why. The drink states it is low fat, however with 273 calories per bottle it's the equivalent of a 7oz steak. It's also loaded with artificial flavourings and stabilisers, giving it a 30 day shelf life, and contains a pitiful amount of 'real' mango (3.5%). 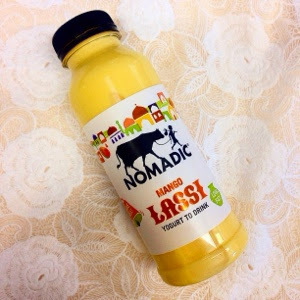 I really wanted to like this product, and found the fact that Nomadic makes it yogurts and drinks in small batches reassuring. I haven't tried their yogurts, but I wouldn't give this chemical minefield a second chance. If you'd like to try it for yourself, It's stocked in 330ml bottles at Tesco and Ocado at £1.49 (however, upon publication of this post there was no sign of the product on either retailer website).